I don't know about you, but we have a bunch of green tomatoes left in the garden after the summer harvest. 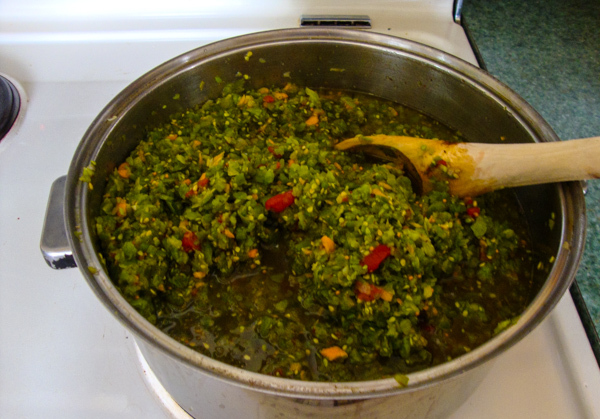 When I was small, I can remember my mom making green tomato relish. So, I asked her for the recipe. Sometimes when I can green tomato relish, I don't make enough to seal them. I just refrigerate them after cooling the jars. They will be used for the winter anyway. Once I made the green tomato relish without the peppers and onions and it turned out fine. Grind tomatoes, peppers, onions. Put together in large pan, put the salt in and let stand 10 minutes. Drain, then mix all the spices, sugar and vinegar in it. Boil 10 minutes. Put hot in jars and seal. My Note: One time when I made this recipe, I ground the veggies in my hand grinder, and added ground carrots for color instead of the red peppers, since I didn't have any. 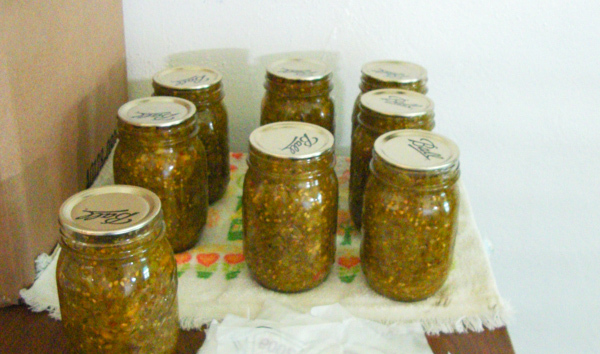 Here's a picture of the Green Tomato Relish I made. This one has the red peppers in it, but I had to go to the store to buy one. Add salt to tomatoes, cover, let stand twenty-four hours, and drain. Add spices to vinegar, and heat to boiling-point; then add tomatoes, peppers, and onions, bring to boiling-point, and cook fifteen minutes after boiling-point is reached. Store in a stone jar and keep in a cool place. My canned Green Tomato Relish. Sprinkle alternate layers of tomatoes and onions with salt, and let stand overnight. In the morning drain, and put in a preserving kettle, adding remaining ingredients, using enough vinegar to cover all. Heat gradually to boiling-point and boil one-half hour. Prepare vegetables and cut in small pieces, cover with salt, let stand twenty-four hours, and drain. Heat vinegar and spices to boiling-point, add vegetables, and cook until soft. 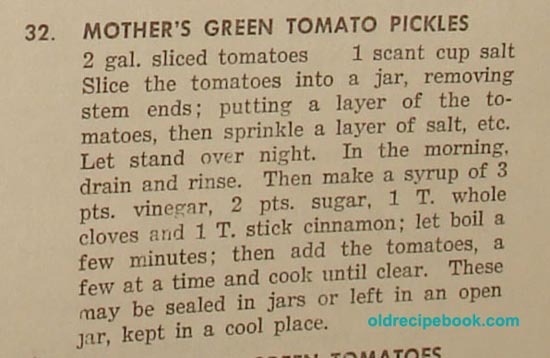 Dilled Pickled Green Tomatoes - Wash green tomatoes and pack into hot sterilized jars. Add 1 grape leaf, dill, 1 piece garlic, small piece of horseradish (if desired) and 1 red pepper. Boil 1 quart water, 1 T. salt (heaping), 1 t. vinegar and a pinch of alum. Fill jars with liquid and seal. 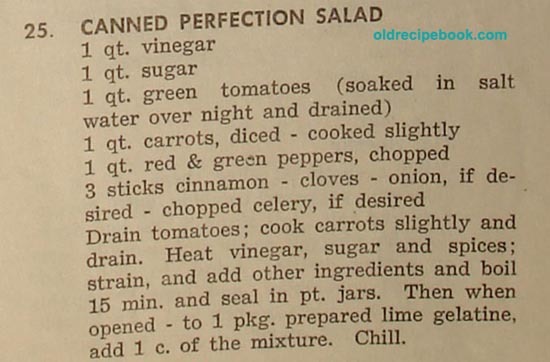 Canned Perfection Salad - This is a green tomato canning recipe that you can add to lime Jello before serving. 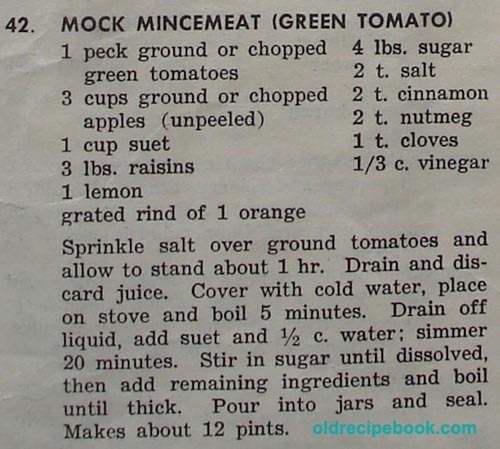 Here's a Mock Mincemeat - Mock Mincemeat has green tomatoes, chopped apples, suet, raisins, 1 lemon, 1 orange, and spices in it. Slice tops off tomatoes and slice 1/4 inch thick, don't use bottom. Dip in water or milk or egg, and then into flour. Fry in skillet with 1/8 inch of oil over med high heat. Salt and pepper. Turn when brown on one side. Remove to paper towels to drain. Reduce heat if browning too fast. 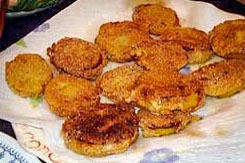 If you would like a heavier coating, dip in flour, then dip in egg, then dip in flour again, then fry. Easy! Wash tomatoes and grapes. Line pie plate with pastry. Sprinkle 1/4 cup sugar on pastry. Slice tomatoes rather thin and place a layer over the sugar. With a sharp knife cut each grape almost through. 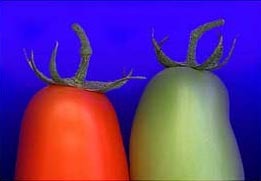 Remove seeds and lay open over the tomatoes till fairly well covered. Cover this with 1/2 each of the sugar and flour and a sprinkle of salt. Repeat, making two layers in all. Cover with top crust. Moisten edges of pastry with water. Press edges tightly together and trim. Brush top crust with cream and bake in hot oven at 425 for 10 minutes. Decrease to 350 and continue to bake 30 minutes or until well browned. Peel and thinly slice 6 green tomatoes. Cook in salted water until they come to a boil. Drain. In a separate bowl, mix sugar and flour. Put 1/2 of mixture in bottom of pie shell; mix other half with vinegar, lemon extract and water. Put tomatoes in pie shell and pour sugar mixture over tomatoes. Sprinkle top with nutmeg and dot with butter. Cover with pie crust and crimp edges. Make some slits in top crust and insert several paper straws to prevent boiling over. Bake for 40 minutes at 400 and then lower temperature to 325 for last 10 minutes. Simmer tomato in boiling water with onion and salt for about 20 minutes or until tender, adding more water if necessary. Add soda. Melt butter in a saucepan over low heat, add flour and mix well. Add milk gradually and cook, stirring constantly, until thickened. Stir in tomato mixture and season with salt and pepper. Serves 6. Combine tomatoes and sugar. Set aside until juice forms. Cook for 15 minutes. Then add Jello and stir until dissolved. Pour into jars and seal. Put jars in hot water bath and boil 15-20 after water starts to boil. 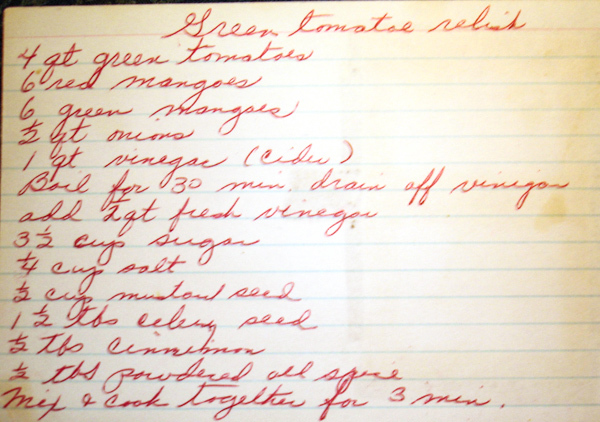 My Note: So, one year I wanted to make Green Tomato Jam, but I wanted it to taste like Green Tomatoes. So, I left out the Jello, and added a teaspoon of lemon to each jar, which gave the jam a lemony flavor. 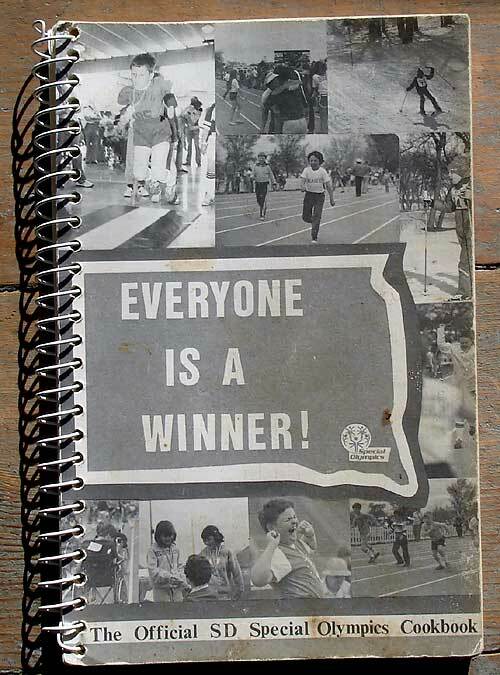 Worked out great.